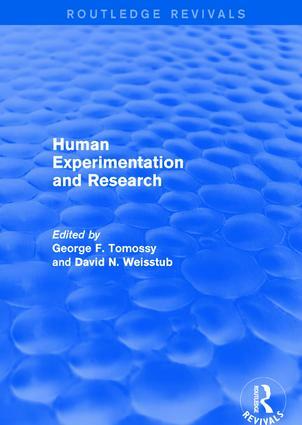 Contents: Series preface; Introduction: human research ethics. Part I: The Historical and Philosophical Foundations: Philosophical reflections on experimenting with human subjects, Hans Jonas (1969); Experimenting on human subjects: philosophical perspectives, Ruth Macklin and Susan Sherwin (2004); Principlism and the ethical appraisal of clinical trials, Eric M. Meslin, Heather J. Sutherland, James V. Lavery and James E. Till; The Nuremberg code in light of previous principles and practices in human experimentation, David J. Rothman; Nuremberg's legacy: some ethical reflections, James F. Childress; The controversy over retrospective moral judgment, Allen Buchanan; Looking back and judging our predecessors, Tom L. Beauchamp; When evil intrudes, Arthur L. Caplan; Shading the truth in seeking informed consent for research purposes, Sissela Bok; Trust: the fragile foundation of contemporary biomedical research, Nancy E. Kass, Jeremy Sugarman, Ruth Faden and Monica Schoch-Spana; Questing for grails: duplicity, betrayal and self-deception in postmodern medical research, George J. Annas; Roles and fictions in clinical and research ethics, David N. Weisstub. Part II: Protecting Human Subjects: Human experimentation and human rights, Jay Katz; The social control of human biomedical research: an overview and review of the literature, Paul R. Benson; Goodbye to all that: the end of moderate protectionism in human subjects research, Jonathan D. Moreno; Is national, independent oversight needed for the protection of human subjects?, Alexander Morgan Capron; National, independent oversight: reinforcing the safety net for human subjects research, Anna C. Mastroianni; Regulating research for the decisionally impaired: implications for mental health professionals, Marshall B. Kapp; Are research ethics bad for our mental health?, Robert Michels; The reform of adult guardianship laws: the case of non-therapeutic experimentation; George F. Tomossy and David N. Weisstub. Part III: Risk and Responsibility: The ethical analysis of risk, Charles Weijer; Defining and describing benefit appropriately in clinical trials, Nancy M.P. King; What research with stored samples teaches us about research with human subjects, David Wendler; Uncertainty in clinical research; Robert J. Levine; Equipoise and the ethics of clinical research, Benjamin Freedman; Equipoise, knowledge and ethics in clinical research and practice, Richard Ashcroft; Ethical considerations concerning treatment allocation in drug development trials, S. Senn; When are placebo-controlled trials no longer appropriate?, Baruch A. Brody. Part IV: Globalization and Corporation - Trust and Participation: International research: ethical imperialism or ethical pluralism?, Ruth Macklin; Is academic medicine for sale?, Marcia Angell; Ethical issues in research relationships between universities and industry, James T. Rule and Adil E. Shamoo; Uneasy alliance - clinical investigators and the pharmaceutical industry, Thomas Bodenheimer; Ethics review for sale? Conflict of interest and commercial research review boards, Trudo Lemmens and Benjamin Freedman; Dealing with conflicts of interest in biomedical research: IRB oversight as the next best solution to the abolitionist approach, Jesse A. Goldner; Restoring and preserving trust in biomedical research, Mark Yarborough and Richard R. Sharp; Privatized biomedical research, public fears, and the hazards of government regulation: lessons from stem cell research, David B. Resnik; Name index.